Asda have started strategically putting some healthier drinks into the fruit and veg aisle - including this wonderful looking thing. I'd seen a few people pick them up and give them a shake and then put them back, so I figured it was worth being the one to give it a try. This is its initial state, note the green dust at the bottom. This looks a lot more menacing, and is a better reflection of the colours. That said this is very much an entry level green drink, it both smells and tastes nice! Essentially it's apple juice, with a touch of kale and lemon juice which keeps the greens looking green. 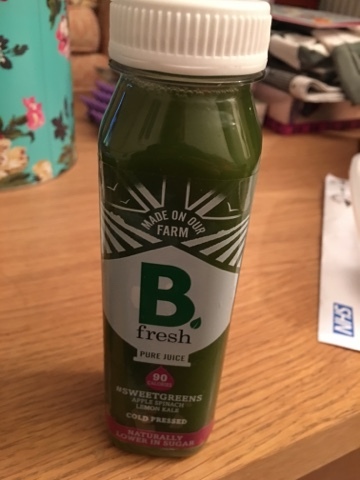 My own smoothies have a lot more kale in them, and taste a lot less like apple juice, they also smell like Farage (the juice at the bottom of the bin) where as this is much more appealing. This doesn't feel as worth the money as some other brands do, purely because it feels too similar to a (good quality) apple juice, but as its a refreshing and uplifting combo I'm likely to have more in future. There are other versions too, and if they contain things that I don't have in stock at home I may buy one and steal their recipes. 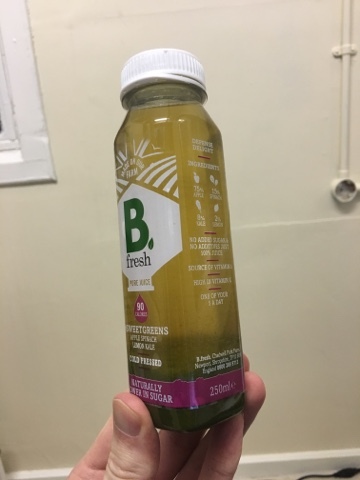 This is cold pressed and not pasteurised so will keep its nutrients, so is perfect for when fresh is not available.